SVN Client or Command Line Interface? This section of the handbook contains tutorials that will help you learn how to create, apply, and revert patches. Patches are the only way that a contributor, like you, can submit code to the WordPress project. Whether you are fixing a bug or contributing to a new feature, a patch is required so the core developers and committers can consider your code for inclusion in the repository. For beta testing the latest development version of WordPress, you will need to be able to apply patches that other contributors have created to determine if the patch fixes the issue. SVN Client or Command Line Interface? #SVN Client or Command Line Interface? Many developers prefer to work with Subversion (SVN) using the command line interface (CLI), while others prefer to use a GUI application. Both are acceptable, and will allow you to create, apply, and revert patches. For command line users, there are programs such as Cygwin (Windows), Terminal (Mac), and Bash (Mac). If you prefer to use a GUI application, the recommended SVN clients are TortoiseSVN (Windows, free/open-source), and Cornerstone (Mac, purchase). Open the folder, and find the file you need to change. Open it in your favorite plain-text editor. Note: Do not use a rich-text editor such as Word or OpenOffice to edit the files. Make the changes necessary, then save the file. You will notice that the green checkmark has changed to a red exclamation point. That means the file has been changed, and is no longer in sync with the repo version. Next you will create the patch file. 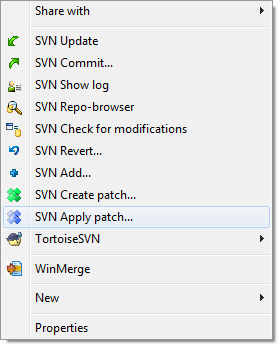 Right-click in the root directory of your SVN checkout folder, and select SVN Create Patch. A pop-up window will show you the list of changed files. Make sure the file(s) you want to include in the patch are checked, then click OK.
You will be prompted to save the file. Create a folder called patches, then type in the filename you want to save it as. Use the format ticket#.diff. 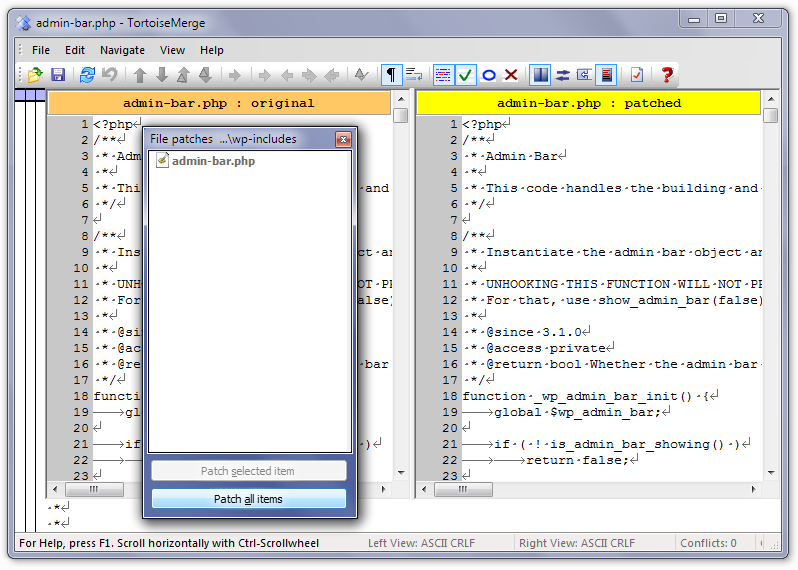 The TortoiseUDiff editor will open and show you the patch file you just created. Got a patch you want to test with your local environment? Follow these steps to test your patch. Part of the troubleshooting/testing process involves downloading and applying patches to your local WordPress trunk install from a Trac ticket that you are involved in. To download a patch, click on the Download icon next to the patch filename in the Attachments section of the ticket (just below the Description section), and save it to a folder called patches. To apply the patch you just downloaded, right-click in the folder for your working copy of WordPress, which will bring up a context menu. Click on SVN Apply Patch. This will bring up a file open dialog window, allowing you to select the patch file to apply. By default, only .patch or .diff files are shown, but you can change the file type to All files if you don’t see the patch file you are looking for. Applying a patch file to your working copy of WordPress should be done at the same folder level as was used to create the patch. If you are in the correct working copy, but picked the wrong folder level, TortoiseSVN will display a notice, suggesting the correct level, and allows you to select that. 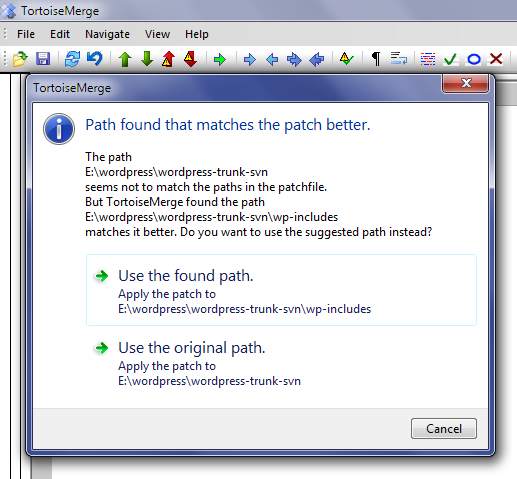 Once you have selected the patch file and correct working copy location, TortoiseMerge will run to merge the changes from the patch file with your working copy. A small window lists the files which have been changed. Double-click each filename, review the changes, and save the patched file to your working copy. During beta testing, you may run across a bug that you are able to fix. Before you submit the Trac ticket, however, you should create a patch with the proposed fix so you can attach it to the ticket. 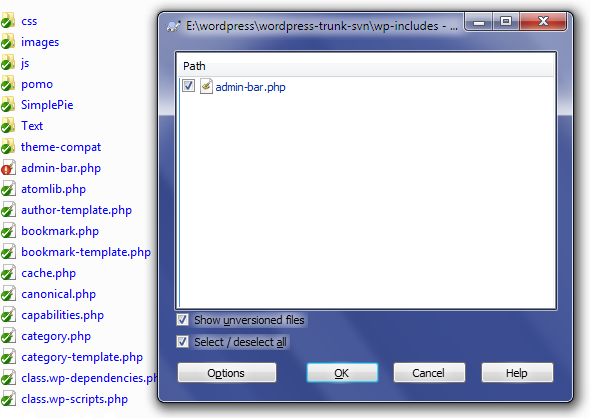 Open the folder where you have WordPress installed via SVN, and find the file you need to change. Open the file in your favorite plain-text editor. Make the changes necessary to fix the bug, then save the file. Do not create patches for minified JS files or RTL CSS files. These are generated automatically from source files. Read more about this build process. Next you will create the patch file, which records the differences between your version of the files and those from WordPress trunk. Patches should be created from the root directory of your WordPress SVN install. If you also like to automatically submit the created patch to an existing ticket, there is an easy-to-use Grunt command available that can take care of both creating the patch and uploading it. In order to use the command, you need to have Node.js and Grunt-CLI globally installed, and you need to ensure that the WordPress development dependencies are installed locally, which you can do by running npm install. Make sure to replace 00000 with the ticket number from Trac. 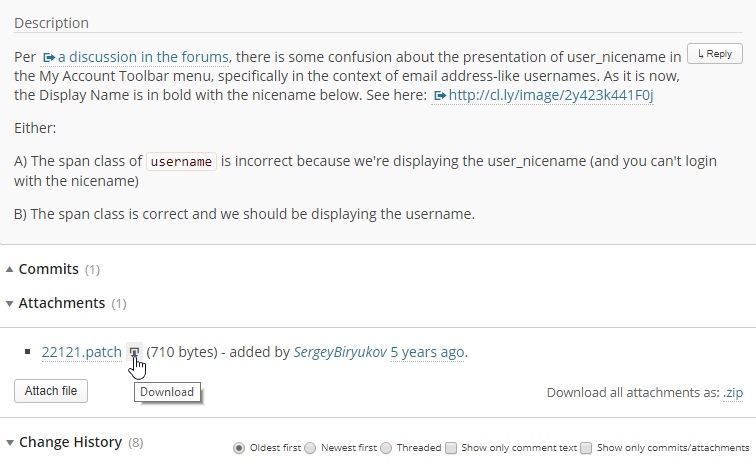 During execution of the command, you may be asked for your wordpress.org user name and password. On a Mac, this will save it to your default downloads folder, from where you can move it to your chosen wordpress-svn directory. On a Windows machine, this will prompt you to save it in your chosen location, which should be the aforementioned directory. You can also download a patch via command line. 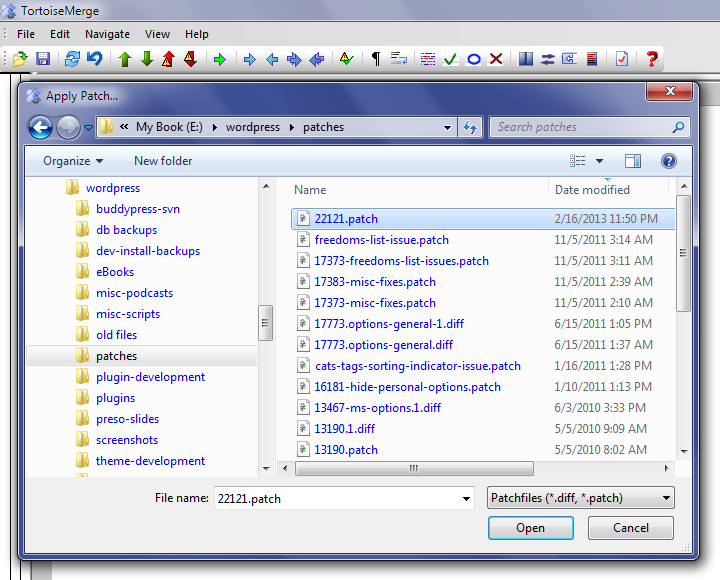 Make sure that you are in the wordpress-svn directory, then download the patch into the patches folder. Note: If you download the patch this way, make sure that it is coming from the raw-attachment directory on the Trac server. You can get this URL by clicking on the patch in Trac, then grabbing the URL linked to by Original Format at the bottom of the page. Now, the wordpress-svn code has been patched with the file you downloaded, giving you the version of the code that the developer who submitted that patch was working with. Note: If the patch fails to apply cleanly, you will need to leave a note on the Trac ticket that the patch needs to be refreshed, and add the needs-refresh keyword to the ticket. To make this process a little easier for you, there is another Grunt command available that takes care of both downloading a patch from an existing ticket and applying it. As mentioned before, in order to use it, you need to have both Node.js and Grunt-CLI globally installed, and you also need to have the local dependencies set up, which you can do by using the command npm install. Make sure to replace 00000 with the ticket number from Trac. The command will automatically download the patch file from the ticket if there is only a single patch available. Otherwise, you can select which patch to download from a list, using the arrow keys on your keyboard.